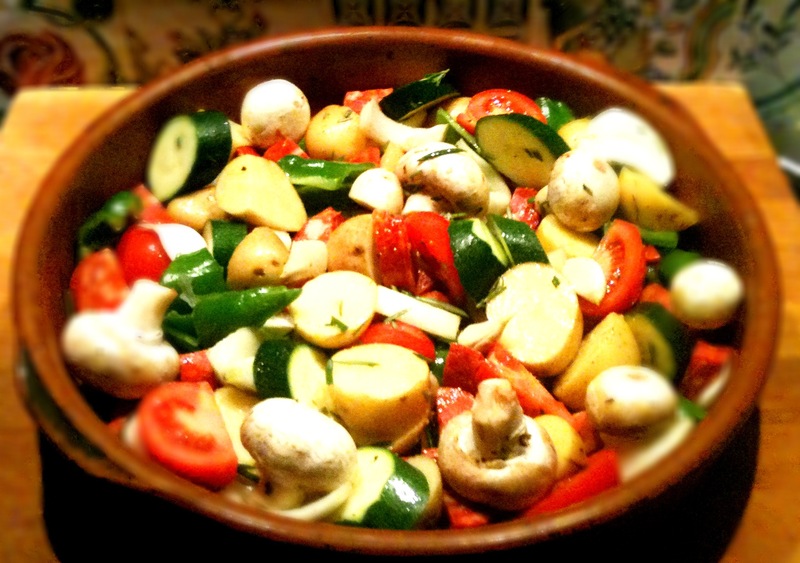 One Pot Mediterranean Marvel | La Rosilla - Lifestyle and food. I’m starting to feel rusty ! I never really get quite prepared for the weather in Spain. It always seems to take me by surprise, even though I religiously check the forecast each morning. I suppose it’s because we live IN the weather at La Rosilla. Up in the mountains, be it in the clouds, nearer the sun, closer to the lightening, secluded for the frost, the route for the rainfall we are IN it. Each year the weather changes, in the 7 years that I’ve lived here, no two winters have been the same. We experienced the first snow, in 80 years !, The hardest Frost, that killed our plants, the wettest one, that turned us and everything mouldy ! This year has been mild, Thank goodness ! So we havent had too many moments of seeing our own breath in the house, and we have had chances to eat Alfresco, and we’ve even had a day on the beach and applied SPF, so we’re not complaining. But as I said never prepared. So when the rains fell this week, my washing was on the line, and it’s stayed there since ssshhh don’t tell my Mother ! My logs weren’t covered, and my arroyo’s that help the water flow around my house not through it, had not been cleared!! So as a family we were feeling soggy, along with our two damp, muddy dogs, who love to snuffle, and dig in the fresh wet mud…oh how I wish there were truffles on this mount ! Their air in our little ‘Finca’ was not the sweetest. Only one thing for it . Freshly baked bread and my one pot Mediterranean marvel. Nothing beats putting a large rustic earthenware dish full of Mediterranean goodness on the table, for one and all to enjoy, taking big spoonfuls, tasting Summer, washed down with a ‘Big fat Rioja’, And some Mosto for the kids . Chop each ingredient to a similar size. Place everything in a large dish suitable for the oven. Add 4 cloves of garlic peeled. Add Olive oil, to coat ingredients and mix with hands. Season generously with good sea salt and freshly ground black pepper. Cook for 40 Mins, until everything is golden and softened. Then Sprinkle the dish with tasty grated cheese. Make 6 ‘wells’ in the cheese and crack in 6 eggs. Put back in oven for 5 / 10 mins until eggs are set to your liking. Enjoy with Chopped salad with fresh herbs, and Home baked bread. I baked Olive tapenande foccacia, to enjoy with our flavours of the med…you cant beat it. I love one pot dishes, mostly because I only want to clean one pot. Looks great and I am sure with the Spanish sausage it is heavenly.